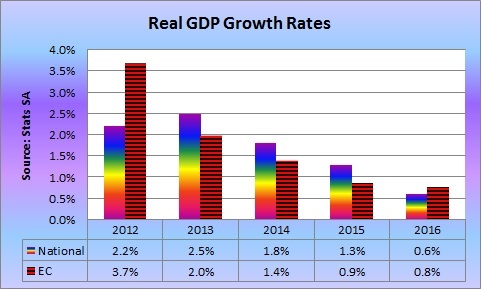 The Eastern Cape (EC) returned to outperforming the national gross domestic product (GDP) growth rate in 2016 after its regional GDP under-performed in 2015. In 2016 the EC growth rate was 0.8% versus a revised 0.6% (0.3%) national GDP growth rate, while in 2015 the respective growth rates were 0.9% and 1.3%. The reason for this outperformance was that the primary sectors of agriculture and mining only have a 1.9% share of the regional economy at market prices. The secondary sector of manufacturing, construction and electricity, has a 17.3% share with manufacturing at 11.4%, while the tertiary or services sector has a 70.1% share with government services responsible for 20.8% with taxes equivalent to a 10.7% share bringing it up to market prices. 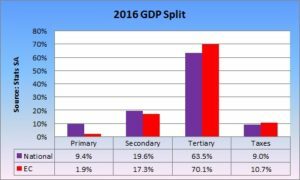 At a national level in 2016 the primary sector accounts for 9.4%, the secondary for 19.6% with manufacturing at 13.9%, while the tertiary sector has a 63.5% share with government services at 15.4%. Taxes add 9.0%. In 2017 there would have been a recovery in agriculture, while financial services and transport should have contributed to EC’s growth performance. On a national basis, agriculture grew by 17.7%, financial services by 1.9% and transport by 1.5%. The 2017 regional GDP data will be released in March 2019. The average forecast in the fourth quarter 2017 survey by the Bureau for Economic Research was that 2017 growth would be only 0.5% rising to 1.0% in 2018. Instead actual GDP growth in 2017 was 1.3%. This survey was however concluded on 5 December 2017, well before Cyril Ramaphosa was elected President of the African National Congress. His election has renewed optimism that growth could exceed 2% this year as former Finance Minister Malusi Gigaba said in East London in January. This is especially so as economists are having to do the same catch-up in their forecasts for developed economies as shown by the consensus forecasts from UK-based Consensus Economics (www.consensuseconomics.com). The US for instance has had its 2018 GDP growth forecast increased from 2.4% in August 2017 to 2.7% in January 2018, while Germany has moved from 1.8% to 2.3% over the same period. France has been upgraded to 1.9% from 1.6%, while Japan’s GDP growth forecast has improved from 1.1% to 1.4%. Only the UK has remained stagnant at 1.4%.